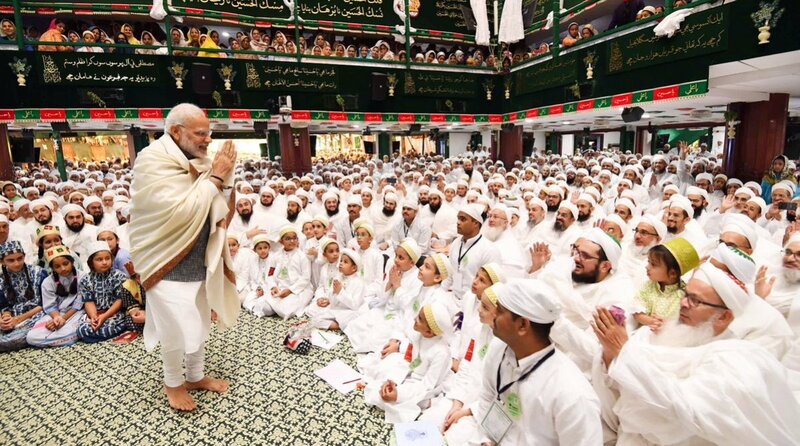 Prime Minister Narendra Modi praised the Dawoodi Bohra community during an event at Indore’s Saifee Mosque where he had come to attend Ashara Mubaraka, which is the commemoration of martyrdom of Imam Hussain. Speaking at the event, the PM said that he has very old ties with the Bohra community and acknowledged their support when he was the Chief Minister of Gujarat. “My ties with the Bohra community are very old. It is my good fortune that your affection has always remained with me. There is hardly any village in Gujarat won’t find a trader from Bohra community. When I was the CM (of Gujarat), the Bohra community stood with me at every step,” said the PM. Recalling the sacrifice of Imam Hussain, the PM said that the community has spread his pious message to the world. “Imam Hussain sacrificed himself for the sake of peace and justice. He raised his voice against oppression and arrogance. This lesson of his is as relevant today as it was then,” said the PM. Thanking the community leaders for inviting him on Ashara Mubaraka, the PM said that the Indian society believes in taking everyone along and sees the world as a single family. “This strength of our society and heritage makes us different from other nations,” he said. At the event, the PM underlined the achievements of his government including schemes such as Ayushman Yojana and Swachh Bharat Abhiyan. “Ayushman Yojana has come as a saviour for about 50 crore poor people of the country. It will ensure free medical treatment worth Rs 5 lakhs in one year. The trial of this scheme is underway,” said the PM. Modi said that his government has successfully introduced policies such as GST, Insolvency and Bankruptcy Code to encourage honest businessmen. Reaffirming his belief that India will continue on a forward march, the PM said that his government has been given the opportunity to take “New India” to the same heights where ancient India once was.